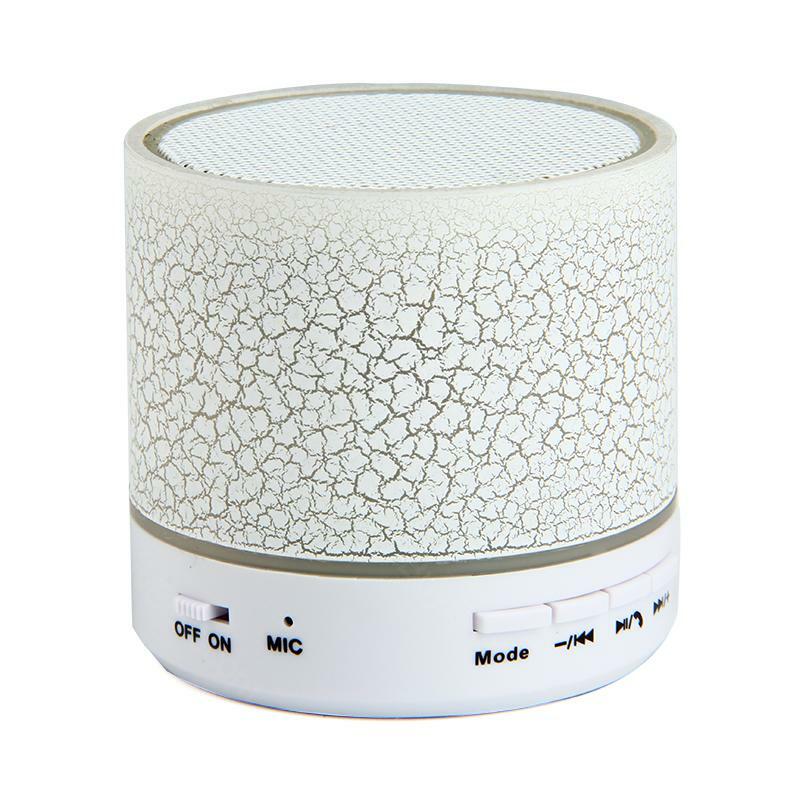 Portable A9 Bluetooth Speaker support USB and AUX music play, not only features bluetooth music play function, but also bluetooth hand-free call, fit for most kinds of phones tablet PC with bluetooth function. 6 colors available. Portable A9 Bluetooth Speaker support 3.5mm AUX and USB/AUX music play, not only features bluetooth music play function, but also bluetooth hand-free call, fit for most kinds of phones tablet PC with bluetooth function. 6 colors available. • Portable design convenient for you to carry with, enjoy music at any time and at any places. • High quality 40mm full frequency speaker, 360 degree surround sound effect, provides resonant voice. • Bluetooth 2.1 technology provides high stability and speed transmission. • Not only Bluetooth music play function, but also Bluetooth hand-free. • Liberate your hands, more convenient guarantee the security when driving. • Built in high definition microphone with noise reduction technology, provides more clear call quality. • Suitable for most kinds of mobile phones tablet PC with Bluetooth function. • Support 3.5mm AUX and USB/AUX music play, enjoy music play when Bluetooth function not support. • Delicate button to control the audio play and answer calls, easy to operate, more convenient and useful. • Large capacity battery provides long-term playing. • 1. Press the button "ON/OFF" for about 6 seconds until the blue indicator light starts flashing and hears "Paring". • 2. Turn on the Bluetooth function of your Smartphone. • 3. Search for the Bluetooth devices and select "C6". • 4. Enter the code "0000" if needed. • 5. If paring is successful, blue indicator light starts flashing every 2 seconds. • 6. For next time, you just need to press the "ON/OFF" button until hear "power on" and release it, then the speaker will connect to your device automatically. A9 Mini Bluetooth Speaker with LED Light with Bluetooth 2.1 Technology With Bluetooth 2.1 wireless technology, high-speed data transmission, as small as it can be heard and heard clearly without interference, can be used indoors or outdoors Built-in lithium-ion battery 300mAh, up to 2 hours of listening time. Support card TF, (card not included) The fashionable and graceful look makes it an ornament to your office. According to the principle of acoustic and aesthetic design Function of volume control support, convenient to operate Built-in microphone for hands-free calls, which sounds great. How to use the TF / micro SD card: Before using the TF / micro SD card, you need to format the memory card in FTA32 format, Specification The main features LED Light: Colorful LED Light Pattern: Crack Pattern Operating Mode: Button Function: Bluetooth Audio Play, Bluetooth Hand-Free, FM Interface: USB, USB / AUX, 3.5mm AUX, TF Card Slot Bluetooth Version: 2.1 Operating Distance: 10m (Without sealed obstacles) SNR:> 80dB Battery Capacity: 300mAh Frequency: 90Hz-20KHz Distortion: <0.5% (At 1KHz) Speaker Output Power: 3W Working Voltage: DC3.7V-4.2V Speaker Diameter: 40mm Impedance: 4ohm Play Time: About 2h Charging Voltage: DC5V Support Audio Format: MP3 Size: 55 x 62.8mm Color: White, Pink, Blue, Purple, Black, Green High quality speaker, this size is very small. The Bluetooth range is 6-10 meters, but a wallless place I have tried everything and it works correctly. Radio sounds good without interference. Easily connects to Bluetooth I am very excited that I did not expect that at such a small size to hear so well I took two and I use it in the office with a tablet that does not have the sound so strong and now it is great and home for children. It has a small minus I can not connect two speakers at the same time to a single device, but I will try with a USB 2.0 Type A Male to Male Male Hi-Speed ​​cable can go to pair two speakers between them. Playback / AUX not only features bluetooth music playback, but also Bluetooth hands-free calling, suitable for most types of bluetooth tablet PCs. 6 colors available Convenient portable design for you to wear, enjoy your music at any time and in any location. The 40 mm high quality speaker with 360 degree surround sound provides resonant voice. Bluetooth 2.1 technology ensures high stability and transmission speed. Not only Bluetooth music playback, but also Bluetooth hands-free. Release your hands, better guarantee driving safety. The high-definition microphone, with noise reduction technology, offers better call quality. Suitable for most types of mobile computing PCs with Bluetooth functionality. Listen to 3.5 mm AUX and USB / AUX music playback, enjoy playing music when Bluetooth is not supported. Delicate button to control audio playback and answer calls, easy to operate, more convenient and more useful. High-capacity battery ensures long-term playback • Pair with Bluetooth: Press the "ON / OFF" button for approximately 6 seconds until the blue indicator flashes and "Paring" sounds. Turn on the Bluetooth feature of your Smartphone. Search for the Bluetooth device and select "C6". Enter the code "0000" if necessary. If the parachute is successful, the blue light starts blinking every 2 seconds. For the next time, simply press the "ON / OFF" button until you hear "start" and release it, then the speaker will automatically connect to the device. My order arrived quickly and safely Thanks BuyBest! a fair and trustworthy salesman. Feels a bit cheap, but the sound isn't as bad as you expect when you unpack it. But it was dirt cheap, a bargain. Does its purpose, is very tiny and cute in a way. I feel it is more a gadget than speaker. You can stand it on your table or shelf or carry with ease if you want to. It shines with random lights, has on/off voice sound, and is cool to play with. I would not recommend it as a main speaker device, but I have a feeling it will come in handy pretty often. Although it is not so superb in its build or sound quality, I can recommend it for gadget lovers, collectors of cute tiny devices. Everything said, it is million times better than no speaker at all. You can definetely enjoy music witht this little gadget. Thank you Buybest for your fast and great service. Muy pequeño, y suena bastante bien. 완전 마음에 들고 생각보다 출력도 좋고 깨끗합니다.